Korvanjund is a Nordic ruin located northeast of Whiterun. 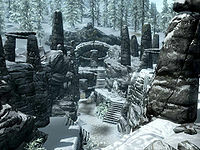 The ruin has three interior zones: Korvanjund Temple, Korvanjund Halls, and Korvanjund Crypt. If you take sides in the civil war, you will be given the quest The Jagged Crown, in which you are told to retrieve the Jagged Crown for either Ulfric Stormcloak or Elisif the Fair, depending on whom you sided with. Korvanjund also contains a word wall that will teach you a word of the Slow Time shout (this word cannot be learned without starting the Jagged Crown quest). The Jagged Crown (Imperial): Find the Jagged Crown for the Imperials. The Jagged Crown (Stormcloaks): Find this crown for Ulfric Stormcloak. The exterior consists of a series of stairs and ledges within a deep ravine, with the entrance into Korvanjund Temple on the upper level at the south end. It is occupied by several bandits, until the start of the relevant quest, when these are killed and their bodies left, not replaced. On the lowest level of the south end, below the entrance to the temple, is a master-locked gate securing an alcove. Within this alcove are two coin purses and an unlocked chest containing leveled loot. The interior is blocked off by rubble if you attempt to enter the ruin prior to starting the quest. There are several urns and burial urns throughout this ruin. When entering, there is a doorway opposite with a cooking spit over a campfire, along with two bed rolls to the right of the doorway, and an unlocked chest under a table with three weapon racks on the wall, holding a selection of iron weapons to the left. The doorway leads directly into a large room that has suffered quite a lot of damage. Part way across the room is a wide flight of stairs up stretching all the way across the room where several enemy soldiers wait, they will attack as soon as they detect you or any of your companions. The stairs descend straight back down to a pair of corridors on the rear wall, however the right-hand of these has caved-in. The left-hand corridor has a wooden door to the west, up a flight of stairs, however this is barred from the other side. It is used as a short-cut back to the exit later. The stairs continue down into another room where you enter it on a balcony, with the remains of a broken walkway straight ahead, more enemy soldiers are below and along the balcony to your right. Following the balcony to the right, you pass the other end of the caved-in corridor with a flight of stairs opposite leading down to the bottom of the room. There is a doorway in the middle of the north wall at the bottom, where your companions will stop and discuss the possibility of an ambush ahead, eventually you will be tasked with finding an alternative route and promised that they will come to your aid when they hear fighting. The way forward is heading east from the balcony and following it around the room. You will pass a novice-locked chest with a medium coin purse and empty random soul gem beside it. Directly above the lower doorway is another, that heads up a short flight of stairs before turning to the east and then back to the north. It leads out onto a walkway above the room ahead and if you are sneaking you will be able to see several soldiers lying in wait. You can start the attack with ranged magic or a bow as there are plenty of oil lanterns hanging from the ceiling and an oil slicks below you, on the ground, with at least one of the soldiers stood in one of the slicks. You can also continue all the way across the room descending at the other end of the walkway which has broken away and fallen forming a steep ramp back down. This puts you on a balcony at the far end of this room. Attacking from here will cause all of the enemy soldiers to rush you, leaving the route ahead clear for your companions. On the right, against the east wall at the bottom of this room is a flight of stairs up to an empty chest with a skeleton holding a copy of the Light Armor skill book Jornibret's Last Dance. The stairs up to the balcony are along the west side of the room. South of the top of these stairs, behind a piece of fallen masonry is an unlocked chest. There is a corridor to the west, part way along this has caved-in, however there is a doorway to the north. Through the doorway is a semi-circular room with a couple more soldiers to fight and also the first dead draugr to be looted. There is a matching door heading east on the other side of the room that leads back out into the corridor on the other side of the caved-in section. A short way further along it turns to the south and descends a flight of stairs, then turns back to the west before descending to an iron door that leads to Korvanjund Halls. This area starts with a room with a stone table and two bookcases on your left that hold nothing but ruined books and stairs in front and more soldiers to fight. There is a third bookcase against the north wall holding more ruined books. At the top of the stairs a balcony continues back to the south with an iron door on the west wall that opens into a wide corridor. Half way along this there is another corridor to the west with swinging blades and the body of a dead soldier, killed by this trap. At the other end of this trapped corridor is a small room with an unlocked chest on a stone table and an empty bookcase with a lever beside it. This stops the blades. The wide corridor continues to the north and then descends a flight of stairs and passes through a pair of iron doors into a corridor with pictures carved into the walls and an ancient Nord puzzle door at the far end. There are a couple of dead soldiers with the ebony claw between them. The combination required to open the door is on the inside of the claw, from the outer to the inner circles, it is Fox—Moth—Dragon. Beyond the door are a flight of stairs up to a turning to the west that ends at an iron door. The room behind has a slightly raised floor in the northwest corner and along the east wall. There are plenty of bookcases around the room, but these only hold yet more ruined books and six upright sarcophagi against the walls, all of which contain slumbering draugr. There is a trap floor in the middle of the room with wooden planking across it and two corridors, one to the west which is blocked by a lowered gate and another to the north. This north corridor after a short way turns to the west, and climbs a flight of stairs, before turning to the south and up again before opening out on a balcony above the previous room. The balcony continues around the room, passing against the west wall a random dagger on a weight sensitive plate, with two garnets beside it. Removing the dagger opens a hidden door to the left that opens a tunnel that twists and turns before reaching another concealed door with a chain to open it on the right. The room beyond has a trapped chest on a stone ledge against the east wall, that triggers a spear trap. To the right of the chest is a leveled healing potion and a flawless amethyst. Following the balcony around the room leads to a walkway that crosses the room below to the east, to another balcony with three completely empty bookcases against the walls, an unlocked chest at the rear against the east wall and at the front of the balcony, on the north wall right beside a burial urn is a handle. This opens the gate that is blocking access to the west. Once you have opened the way, the corridor to the west, leads to an iron door that leads into Korvanjund Crypt. The crypt is the center most area of the temple. This area starts with a corridor descending to the west, before turning first north then east and entering a room with bookcases around the walls and a sarcophagus on either side of a throne. Sat on the throne is a draugr boss of the highest level available who is wearing the crown and both sarcophagi also open to reveal leveled draugr. It is quite possible to be facing three deathlords here. Behind the throne is an apprentice-locked chest with a leveled magicka potion beside it. At the rear of the room is the word wall for a word of the Slow Time shout, with wooden stairs along the east wall that leads up to an iron door, with a barred wooden door beyond that, which opens near the beginning of the Korvanjund Temple area. On the east side of the final room, you may spot a couple of bowls placed higher than you can normally reach in corners. They are both on stone shelves: one above a bookshelf, the other close to the stairs. They hold valuable loot in the form of gems, weapons, and a Spell Tome for Conjure Flame Atronach, and although they may be difficult to reach by jumping, they can be toppled through ranged attacks. The easiest way is to use the Unrelenting Force shout to shake each bowl. Just remember to look around the entire room for the gems as they fly out very far in different directions (see notes). On top of the barrow entryway, under a tree, is the treasure chest for Treasure Map VI, assuming that you have obtained the map.